Essentially, a group of scientists at the University of Córdoba, Spain created an image of the Crucifixion based on the Shroud of Turin. Thus, it is the most accurate representation of our Lord on the cross. 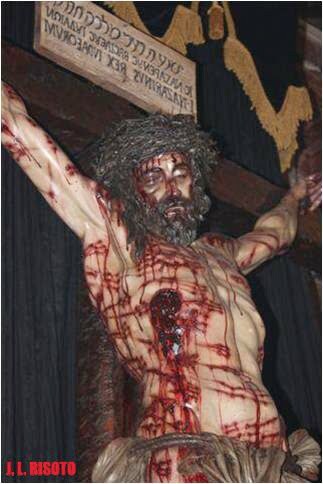 "The Christ of the University Brotherhood of Cordoba was created by a sculptor who is also a professor of the University of Seville, Juan Manuel Miñarro.This Christ is the result of the work of a multidisciplinary team of scientists who are researchers of the Shroud. It is the only Shroud-based Crucifix in the world and it reflects, up to the last detail, the multiple traumatisms of the corpse, as they are reflected in the Shroud of Turin.The image represents a body, 1.80 m tall, according to the studies of the Shroud by the universities of Bologna and Pavia. The arms and the cross form a 65 angle. In it, the wounds of the Man in the Shroud of Turin are reproduced exactly. This Christ is the result of the work of a multidisciplinary team of scientists who are researchers of the Shroud. It is the only Shroud based Crucifix in the world and it reflects, up to the last detail, the multiple traumatisms of the corpse, as they are reflected in the Shroud of Turin. The image represents a body, 1.80 m tall, according to the studies of the Shroud by the universities of Bologna and Pavia. The arms and the cross form a 65 angle. In it, the wounds of the Man in the Shroud of Turin are reproduced exactly." I think all of us can benefit by meditating on these images even for a minute, if we can, daily. Please spread the word about this. Let your clergy know. I didn't know about it until recently, and I think the scientists completed it in 2010.